You should not have posted this here, as this is not a review. Just maybe the gun’s O.K. and you need another compressor. One with more storage capacity or more CFM. I would love to able to try the harbor freight gun. Unfortunately they do not ship to Canada. Do you know anyone in the US who could ship one for you? I got this for Christmas (I asked for it). Used it for the first time yesterday and it did a great job. I have a Bostich pancake compressor and it had no problem keeping up with the small lacquer job on a shoe box. I agree with Gene. While it is low pressure (LP) which ever spray gun you use needs high velocity (HV). Your compressor is likely way too small to work well with an HVLP gun. One downside i have to declare. Overspray is horrendous. Maybe playing with the pressure, more control can be had. I had it set to 30psi at the gun. I am going to play with the pressure today, when it gets over 50 degrees. I had to shoot it about 12 to 15 inches away, considerable overspray but a nice fine mist, similar to the rattle can. One huge plus however is clean up. A separate jar of lacquer thinner, a little shake and a 5 second spray, done. I really recommend the Woodriver Pro HVLP gravity feed gun from Woodcraft for $30. It is comparable to the more expensive Porter Cable (I can’t tell the difference). The Woodriver gun performance is excellent with my mid-size compressor. Pancake compressors are great for nail guns, but you may slow you down for spraying with any gun. When in doubt, check that the scfm of the compressor is higher than the scfm of the tool. Anyway, the gun has 3 controls and it took me a while to learn how to use them and how they interact. The fan adjustment on the side is pretty simply. I always use some fan even on small parts because it reduces how fast the finish builds and give you more control. The control directly behind the trigger is the fluid volume adjustment and the one on the bottom is air volume. The best way I have found to adjust the gun is to open the fluid volume about half way (maybe a bit more) and close off the air volume adjustment. Now pull the trigger all the way and start turning up the air. At first you will see an actual stream of fluid (finish materiel) coming from the nozzle. As you turn up the air the finish will begin to atomize. When it looks like the finish is adequately atomize open the air just a bit more. Now test the gun on a scrap and see if it puts the finish down smooth. Ultimately you have way better control than a high pressure gun and unless you are doing production work or auto finishes your pancake compressor will probably keep up. For certain, this new gun consumes less than half the air when compared to the high pressure gun I had, the amount of control I have is much better AND the over spray and finish consumption is 90% less. I have a fairly large compressor and I was trying to use my HVLP gun like my old high pressure gun. I figured the air had to be fairly high to atomize the finish but I was wrong. Something else that will fool you, it doesn’t look like there is much coming out of the gun but when you start applying the finish you find out its simply putting most the finish one the object you are spraying and not in the air or all over everything in your shop! I was thinking today… I think I’ll go buy 2 more guns before everyone else discovers how great they are and Harbor freight jumps the price up. I just purchased and began using an hvlp spray gun. I’d say the reason for the problems is that you need a larger compressor. H.V.L.P. High Volume Low Pressure. I have a 60 gallon compressor and my gun really works great. I think you need at least 13 cu ft/minute. Some guns need more. Only a larger compressor can supply this volume or an hvlp compressor specially designed to supply the right air volume. that’s your problem. Your compressor will never supply the required air no matter which hvlp gun you use. Seems everyone wants and or calls a gun HVLP……….Most “true” HVLP guns and systems require about 21 cfm of air which in turn requires a BIG compressor. 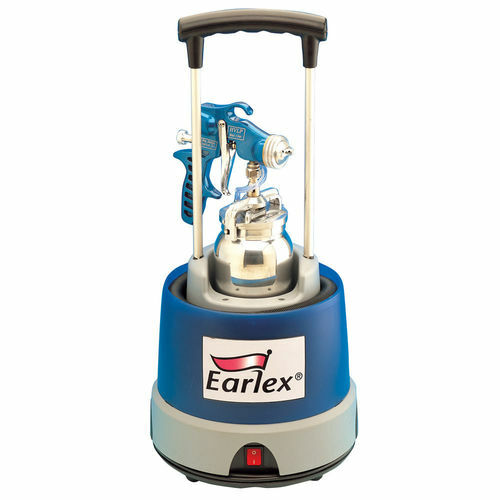 Its all about the SCFM’S or Square Cubic Feet per Minute.A pancake compressor will deliver the pressure but never the volume.I know I have made the same mistake,thinking that an HVLP gun is the answer spraying finishes.If your real serious about spraying finishes then take a look at Earlax hv 5500.It is a HVLP system that employs a turbine witch delivers a dry high volume of air.It has good reviews some right here on this site and others on Amazon.I plan to get this same when the budget allows. By the way this post realy belongs in the power tools forum just FYI. Again, it’s the compressor. You cannot use an hvlp gun unless you have a special compressor or a very large one, up to 30-60 gallons. Simple as that. How far are you from the us border there is a harbor freight in Grand Forks I think. Former Winnipeger here.